KhalifaSat, the first satellite fully built in the UAE by a team of Emirati engineers, will be fired into orbit on October 29. Yousuf Hamad Al Shaibani, director general of the MBRSC said, “KhalifaSat is a unique Earth observation satellite which aims to serve humanity." 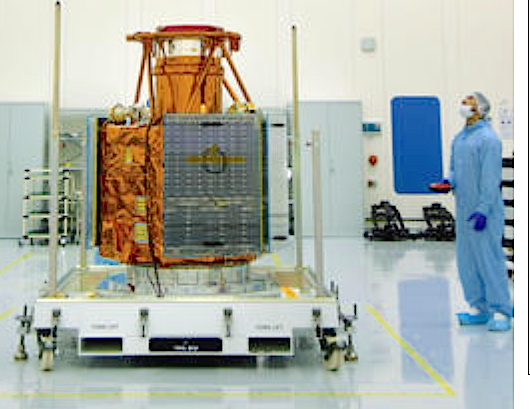 KhalifaSat will join the UAE’s two imaging satellites already in orbit — DubaiSat-1 and DubaiSat-2. According to the Dubai Media Office in a report from earlier this year the UAE Space Agency is planning to launch two satellites this year. 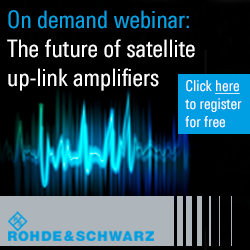 Other goals mentioned include sending a probe to Mars by 2020. Dubai Crown Prince Sheikh Hamdan tweeted on Wednesday that the satellite will be launched from the Tanigashima Space Centre in Japan in partnership with Mitsubishi Heavy Industries, the official news agency WAM reported. "This is an important milestone for our country, an achievement made possible because our leadership supports Emirati youth and encourages them to excel in the fields of innovation and technological development," said Sheikh Hamdan in one tweet. Dr. Mohamed Nasser Al Ahbabi, director-general of the UAE Space Agency, said last month that once the launch has taken place, the UAE will have 10 multi-purpose satellites, raising the UAE investment in the space sector to AED22 billion. He said that the KhalifaSat project has contributed, during all stages of design and manufacturing, in developing national capabilities in the field of satellite manufacturing, which will be an essential factor in developing the space sector in the country. "KhalifaSat marks a critical milestone in the nature and form of the UAE's investment in the space industry. 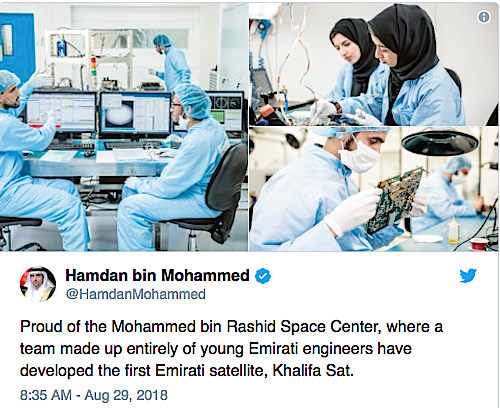 KhalifaSat is a source of inspiration for Emirati generations because it is the first satellite to be fully manufactured in the UAE," he told WAM at the time. He also told WAM that the achievement highlights the "outstanding scientific and technical capabilities of Emirati citizens that would enable them to achieve any scientific goal they aspire to accomplish." "All engineers working on Khalifasat's project should be proud of what they have achieved during the development phase," and he congratulated all UAE Space Agency employees and Mohammed bin Rashid Space Centre on the achievement. Last year the UAE began its first astronaut program with the goal of sending four Emiratis into space in the next three years. Two of the astronauts from the Emirati corps will be trained in Russia to include one primary and one backup. One of the astronauts will be joining a crew of Russian commander and an American astronaut in Soyuz MS-12 spaceflight which is planned to launch to International Space Station (ISS) in April 2019.